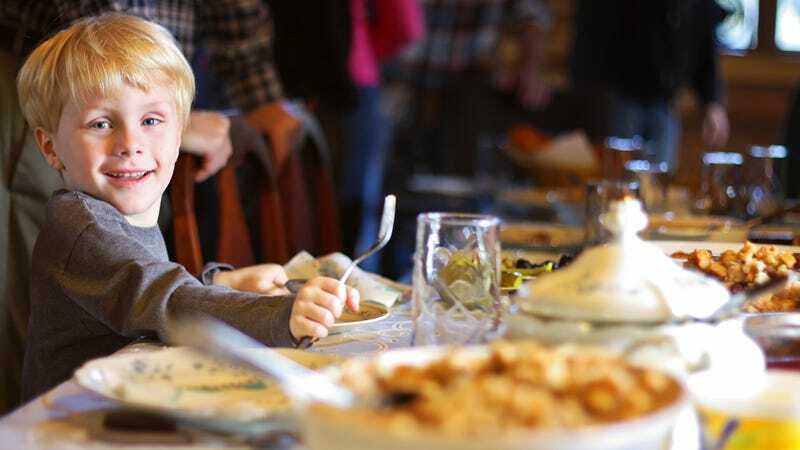 The Huffington Post argues cheekily today about “Why The Kids’ Table Should Be Forever Banished From Thanksgiving Dinner.” Writer Lee Breslouer goes off on how adults will just be looking at their phones (um, what?) and talking about their jobs (possibly true). But including children in the conversation at the same table will help keep things on a more engaging, civil level, possibly steering clear of arguments. Forgive me as I wipe pre-Turkey Day tears of laughter from my eyes—any guesses on whether Breslouer has kids himself? Nope, and I don’t know what kind of mini-Algonquin Table participants he’s hanging around with. But I think he’s missing the joy of the kids’ table for parents. Like the chance to enjoy dinner on fancy china without watching constantly to make sure that glass of milk isn’t too close to the edge of the table. It probably is, but it’s at a different table. That’s the kids’ table’s problem. In my sister-in-law’s home (and bless her heart forever for hosting), we all fit comfortably in the dining room, while the children happily hang in the kitchen. Who really has table seating for 16 anyway? I’ll give one point, though, to the HuffPost article: speaking out against the antiquated practice of seating adult single people at the kids table. Breslouer says this still goes on, and this seems ridiculous. With people now getting married later in life, if at all, the Noah’s Ark pairing of Thanksgiving couples is a vastly outdated practice. Pile your dining-room table as full as you can with the adults you are happy to host, coupled or not. But give the kids—and yourselves—a break, and put them in a space of their own. Are teens too young to drink coffee?